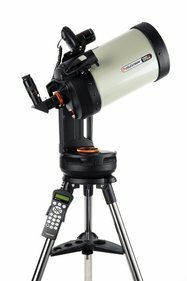 A catadioptric (Schmidt-Cassegrain, Maksutov-Cassegrain, compound or lens / mirror) telescope combines many of the best features of the refractor and reflector telescopes, and a few of the less good characteristics. 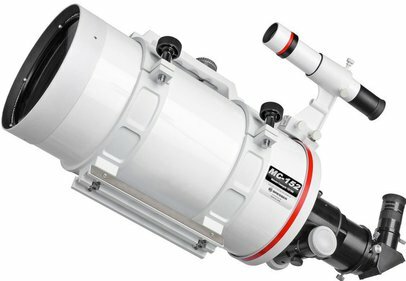 At the bottom of this page you will find a description the main features of a catadioptric telescope. They perform like the big telescopes and have long focal lengths. You take them with you in a lightweight and easily transportable package. 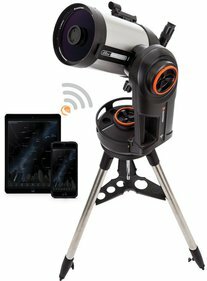 This, of course, is very handy when taking the telescope with you to areas where you are not hindered by city light (light pollution). 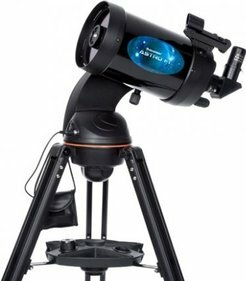 The optical design of catadioptric telescopes prevents coma (which reflectors suffer from) and chromatic aberration (which refractors suffer from). 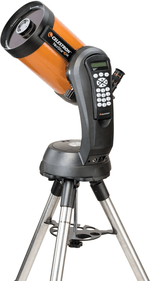 When using a catadioptric telescope stars will appear crisp and coma-free in your field of view and no coloured halos masking vague details and colours will develop around stars and planets. Some curvature of the field of view will be visible in catadioptric systems (especially in fast focal ratio models). Photographs often show more on the edges of large fields of view than actual observations do. 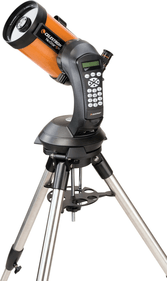 Many catadioptric telescopes are supplied with a Go-To mount. 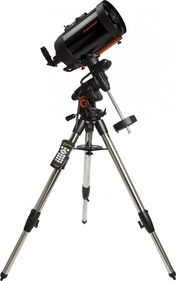 A Go-To mount combined with a slightly heavier tripod ensures that the small optical tube assembly of the telescope is stable on both sides, considerably reducing image movement. 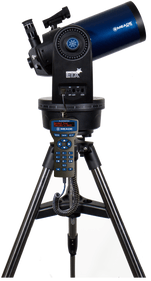 The power source driven tuning system makes sure that the objects that you want to observe remain in your field of view. There is no need to adjust manually. All you need to do is enter the coordinates. 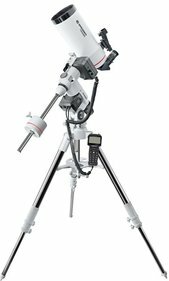 The catadioptric slow motion controls, often not available for reflectors, makes the telescope's positioning easier. 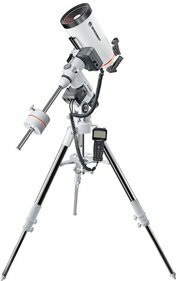 In addition, storing and setting up the catadioptric telescope is easy and quick, also because the tripod is very light. 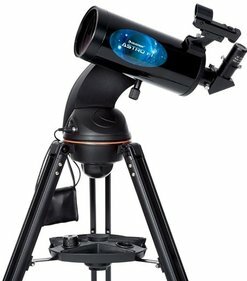 What are the disadvantages of a catadioptric telescope? Firstly: its cost. 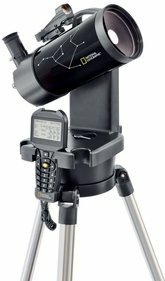 An 8 inch Schmidt-Cassegrain costs 50% to 300% more than an 8 inch reflector (but roughly the same as a refractor). 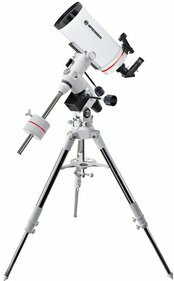 Secondly, Schmidt-Cassegrain telescopes have a low contrast range on the moon and the planets compared to refractors or most 6 inch or 8 inch reflectors. This is because the larger secondary mirror scatters light, resulting in light loss. The catadioptric telescope is not exactly good at cleanly splitting close binary stars either. And yet a Schmidt-Cassegrain will usually perform better than a reflector of the same aperture. 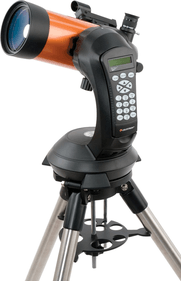 A Maksutov-Cassegrain will generally offer a better contrast than a Schmidt-Cassegrain. Even though their big apertures facilitate detailed deep space observing, catadioptric telescopes generally do not yield the same bright images as other telescopes of the same or similar aperture and power do. 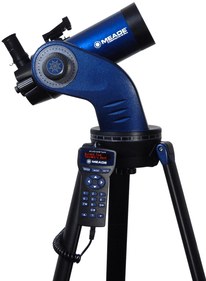 Are you looking for a portable, affordable telescope that can do just about anything? 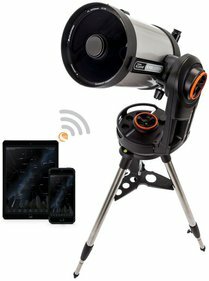 Then there is no better investment than a good all-round catadioptric telescope.